England’s U-21 Debacle: How to Improve the Country’s Youth? Having crashed out of the European U-21 Championships bottom of their group, the inquest is already out on the causes of England’s failures at youth level. Rory Smith nailed it. English football loves its failures and the responsibility shedding fallout that follows them. The truth is, when it comes to England there is no panacea that can solve the structural issues that hamper the national team. However, that doesn’t mean that the problems at hand should be added to through sheer ignorance and incompetence. What is the purpose of the U-21? Whether it’s there for winning youth tournaments, prepping a new generation for the senior side, or for educating the best and brightest in the traditions of the nation’s football culture, it is utterly failing on all fronts due to reasons beyond its control. The player drain into the full-senior team is inexcusable and must stop immediately. Failures of the past should not rob the next generation of their chance to develop both as individuals and as teammates. If England don’t have an attacking midfielder over the age of 21 then tough – improvise or call-up a name from outside the usual clique. Using Phil Jones, Alex Oxlaide-Chamberlain and Tom Cleverley to plug gaps in previous aborted development strategies denies them experience of losing, winning and learning together at a less intense level. Any development under the burning scrutiny of the senior side will only lead to the panicky, safety-first tendencies that already riddle the English game to be handed down once more. What chances do youngsters have of learning to control a game and their composure when playing for England, when supposedly experienced international veterans hoof at the first sign of trouble? 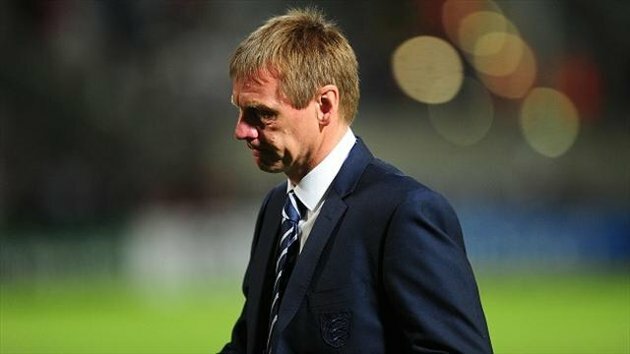 Though Stuart Pearce may well be a proud and pleasant servant of English football, the U-21s need a manager able to understand and articulate the goings on in the zeitgeist of the international game. Player development isn’t based upon motivating speechs and war stories of away trips with Terry Butcher; a well-meaning crony of the FA will not do regardless of his caps. It’s time for England to cut their losses and make a clean break with the U-21s. Detach them from the seniors, appoint a tactically astute, experienced coach and give them time to blossom; rinse and repeat. Only through a policy of generational development can we hope to advance the standards of the English game. The Return of the England B Team? What do Michael Owen, Gareth Barry, Aaron Lennon, Jermain Defoe and Phil Jagielka all have in common? They all featured in the England B Team’s last fixture, a 3-1 victory over Albania in May 2007. B Teams are out of fashion and have oft been derided (look no further than Chris Sutton’s refusal in the buildup to the 1998 World Cup). However, with the recent failings of the U21 side perhaps there can be a place for a B Team in modern international football. Much has been made of the gulf in class between England’s squad and the other major nations in the U21 Euros. The likes of Isco, Lewis Holtby and Marco Verrati lead the line for their respective countries while England’s young stars played for the senior side in a friendly against Brazil. Admittedly it was 19-year-old Oxlade-Chamberlain who impressed the most in the Maracana, giving his team some much-needed spark but he could have formed the focal point of Stuart Pearce’s side in Israel. Yet the English youngsters on show in these Euros were more familiar with the Championship than the Champions League. What if there was another squad, coached by England’s senior staff, that could give younger players a grounding in international football? After Germany were knocked out of Euro 2000 in the group stage, the German Football Association formed ‘Team 2006’, a secondary national side to develop young players in preparation for the 2006 World Cup. Team 2006 played friendlies against other B Teams but also some first XIs. Tim Borowski, Arne Friedrich, Mike Hanke and Timo Hildebrand all went on to appear in the 2006 squad but there were also benefits after the tournament with the likes of Mario Gomez, Robert Enke, Stefan Kießling and Simon Rolfes all going on to receive senior caps. A B Team could also be used to integrate ‘late bloomers’ into the international set-up before they play for the senior side. There seems to be little place for the traditional English centre forward in recent years; despite impressive goal tallies, Kevin Davies, Grant Holt and most recently Rickie Lambert have been given little to no chance to impress at international level. A B Team that mixed younger raw talent with older players would give Roy Hodgson a chance to assess the depth of his options. Rory Smith is correct that the problems run deeper than the failings of Pearce, Butland, Zaha et al. in Israel. However, some creativity and the exploration of different approaches could play a part in the recovery of English football. This entry was posted in Analysis and opinion and tagged england, stuart pearce, u-21 by The False Nine. Bookmark the permalink. England B sounds a good idea anyway, but why not in addition to the U-21s? And what is stopping our talented younger players, in search of 1st team football, from finding it abroad like 100s successfully do from other countries?